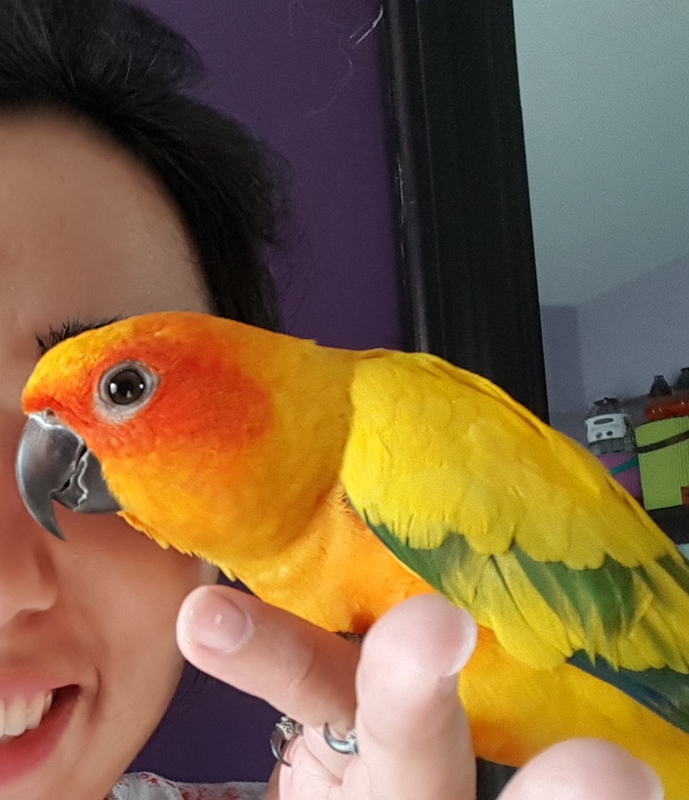 So that day, as painful as it sounds, rendered all efforts of trying to find my bird, futile. What later followed was solitude and coffee ... and well some chocolate as well. I believe solitude is a great healer, though it takes its sweet time. And that wasn't just enough, I ended up working as well, my concentration level amidst sorrow was intense or perhaps I needed some outlet to think of something else. The shop keepers around my place, including Zaidi's Studio were kind enough to paste posters of my lost bird though to no avail, unfortunately. It really is the gesture that matters so I'm very grateful to everyone who tried to help regardless of the outcome. 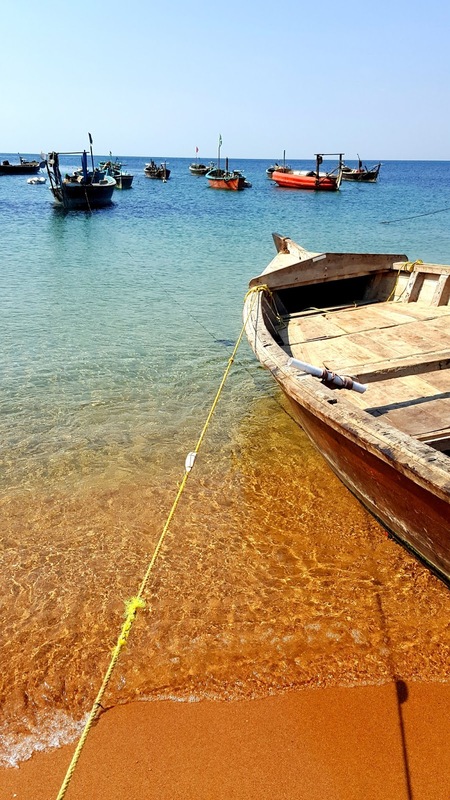 The next day was a working day which required going towards the waves yet again, and there's something very serene and calming about the waves as they approach the shore, eventually soothing wounds that are not physical yet quite palpable. And despite the work trip, I found myself looking around for birds at a point in time. 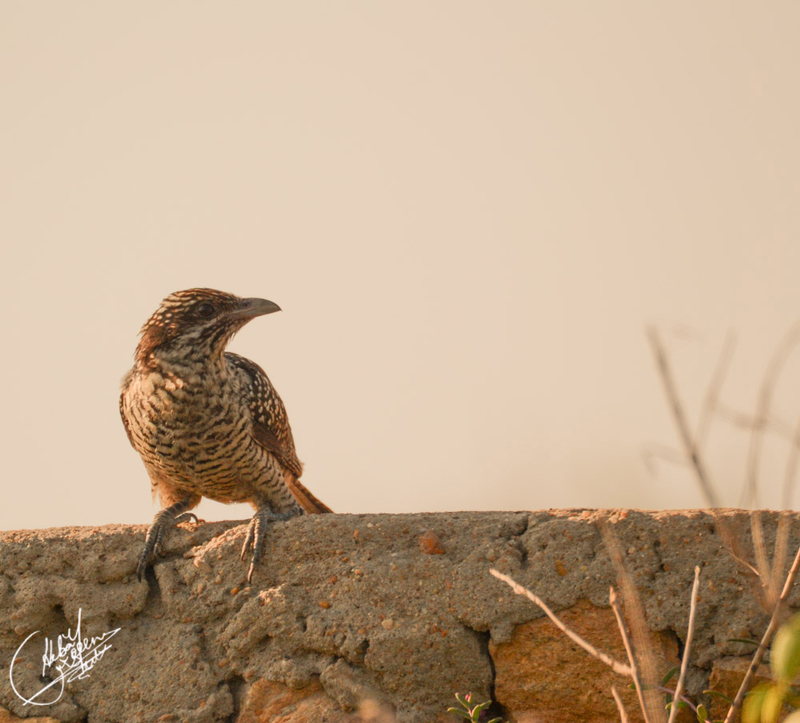 Sandspit and Hawks Bay are blessed with nature's beauty yet polluted by us, humans ... you will still find some persevering birds that haven't lost hope in us, at least not yet. 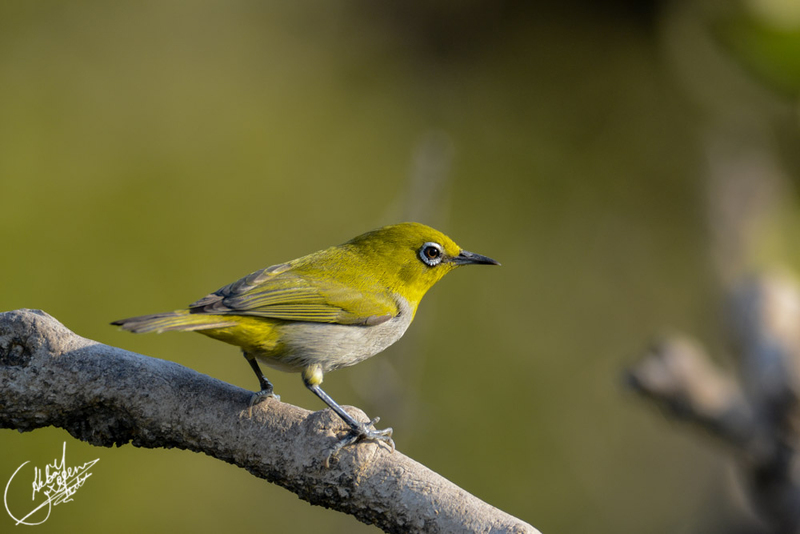 Anyway let's cut my sob story short and talk about the new discovery - the oriental white-eye of Hawks Bay! We went last Sunday and explored the shrubs that housed these teeny tiny beauties. 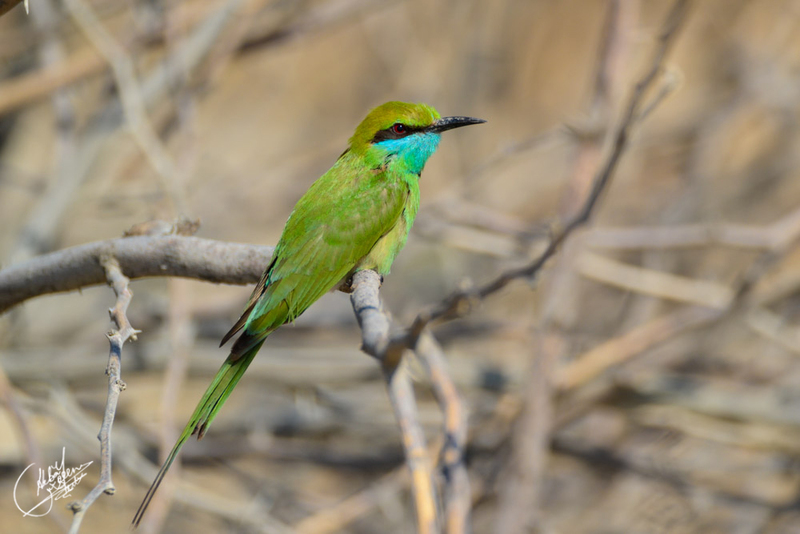 The trick of birding is that you go as early in the morning as possible because once it gets late, say afternoon, most of the birds disappear and go into their resting phase. 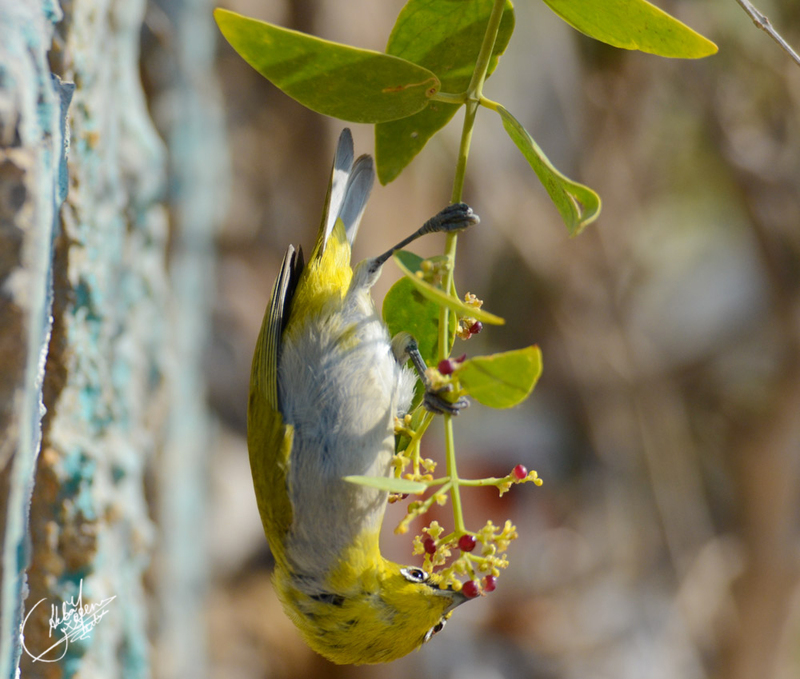 After gathering at the meet-up location, we headed towards Hawks Bay which we reached around 830ish and went straight to that patch of shrub of wild berries where the oriental white-eyes were having a buffet breakfast. Their call is so beautiful and camouflage so apt that you have to focus and remain still for a while until you notice some movement and your eyes dart across for that perfect shot. 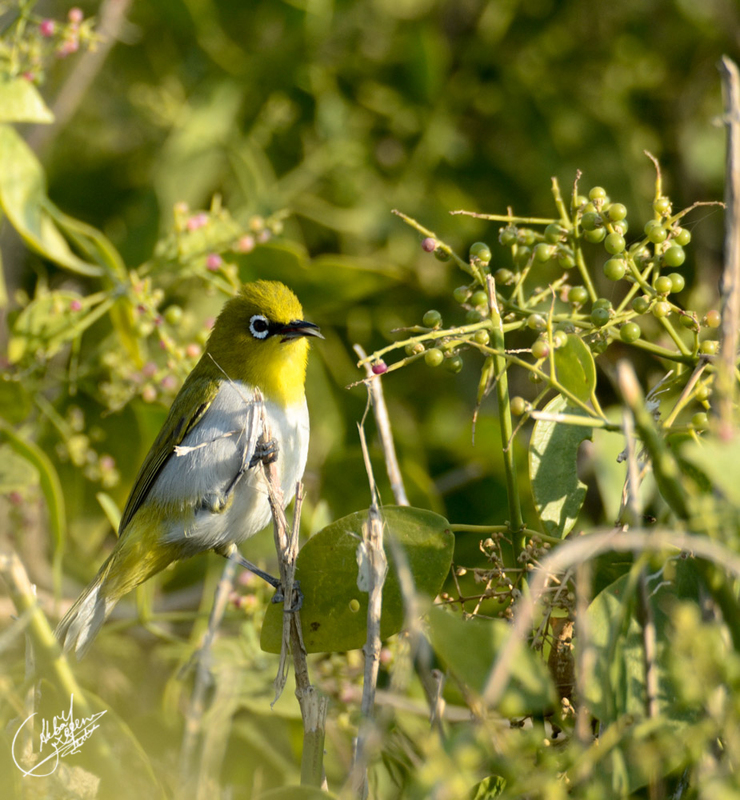 There were numerous oriental white-eyes singing away and devouring the wild berries. As inquisitive as some of us were, we tried a berry or two; trust me the fruit tasted of perfume yet was very sweet. Not everything is meant for human beings. Period. 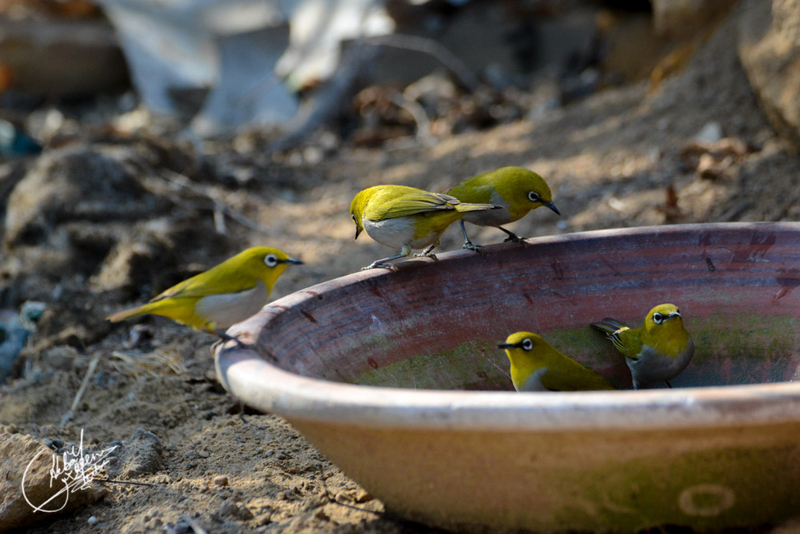 Oriental white-eyes (Zosterops palpebrosus) a.k.a Indian white-eyes are small birds, about 3/4th the size of a house sparrow. They appear quite gregarious and forage in small groups while feeding on small insects and nectar, in this case these wild berries that were growing in shrubs spread out on the surface of sand. These birds have a distinctive white eye ring and spectacular brown eyes, to capture all of this you need ... let's say, a good lens. Don't let the images deceive you, these are very, very small birds, though not microscopic either. Oh but ... you will fall in love with nature a little more when you encounter these green beauties. 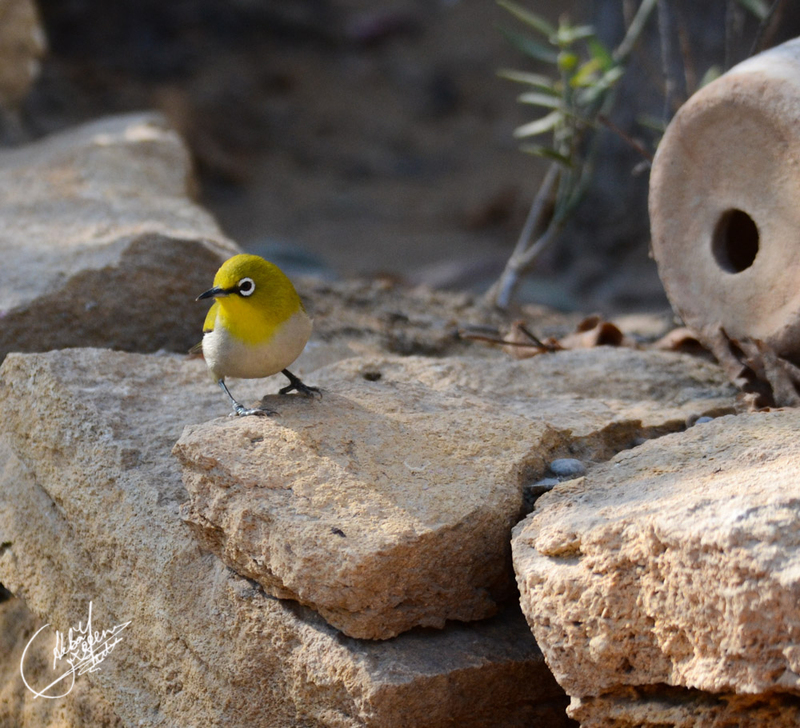 As we explored the surrounding areas in search of more and more of these oriental white-eyes, we were awestruck by the vast land and its resident birds while quite disgusted by the pollution around. 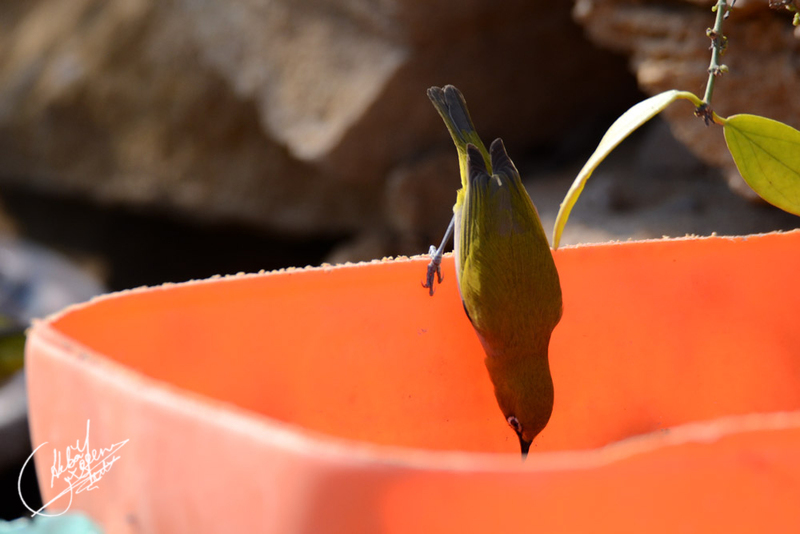 We saw one such oriental bird hopping around, almost diving into a trough of drying water to quench its thirst. That's when we realised the need to fill the nearby clay bowl with water. Hina, one of our brilliant wildlife photographers eagerly turned on the tap to fill it with enough water for the birds. However there was barely any water left but those few millilitres were sufficient for our tiny friends. 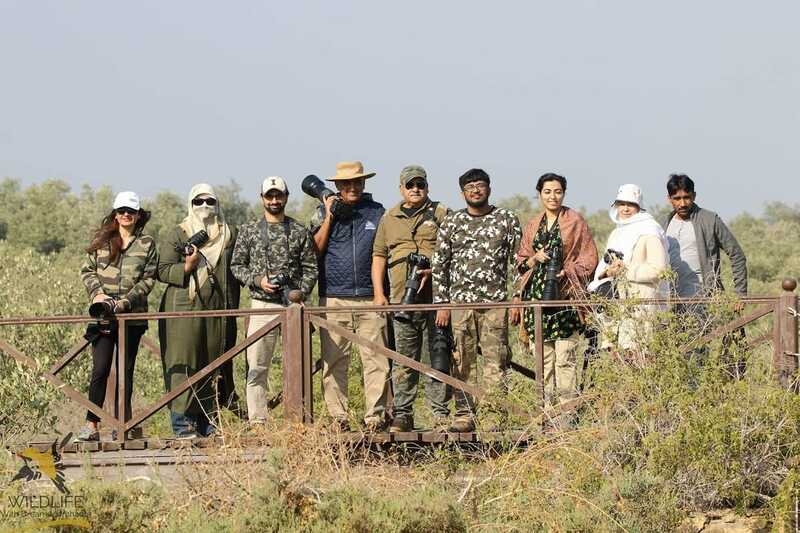 They came one by one, gathering around the newly discovered water body and it was a sight not to miss but to capture. Water ... are you there? Thank you. Hina. This should do! Later, we followed the road leading to Aqua Beach, God knows wherever that was or whether it even existed. When the senior boys got to know that two of us including me have never been to Mubarak Village before, they suggested we go a bit further to explore this gem of a place. It indeed is amazing but the plastic peril has taken over all of our beaches and there was litter all around, irresponsibly scattered by tourists. Below is one breathtaking sight of Mubarak Village. And yes, the one and only bird greatly despised by our senior boys was there, waiting and smiling ... and had a pose ready. 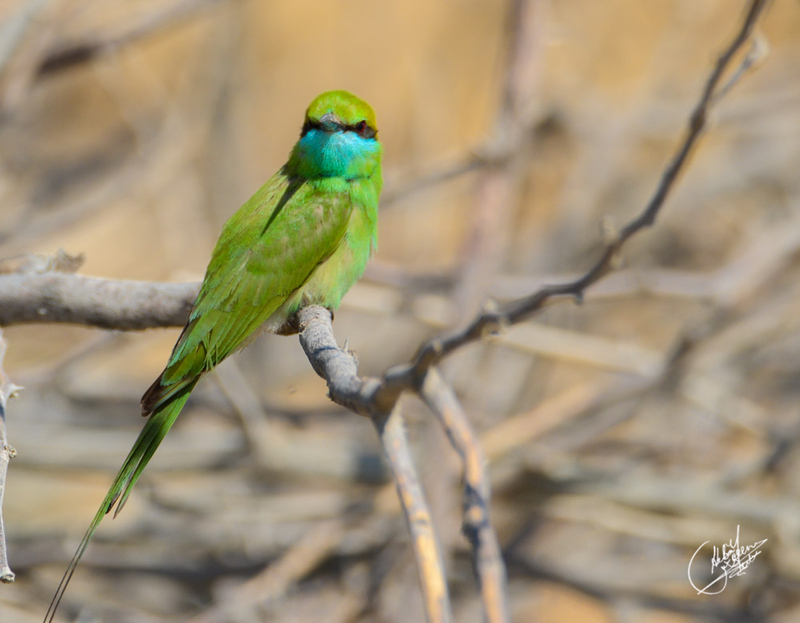 Waqar Mursalin is the guilty person who introduced me to this green bee-eater below, that was anticipating some cool photography. The bird sent its warmest regards to its best friend, Saeed Jamal Tariq who earlier did not let me take a picture of this gorgeous fluff ball ... well not exactly a ball, a bat perhaps. We had lunch at a local restaurant, next to which was a government owned fire control authority with two groups of employees playing cards. Well, these poor guys were on duty on Sunday and it was around 2 p.m. and they could just be availing some time off, not that they would have extinguished any fire with their grounded, rusty vehicle. Don't judge, okay?!?!? Please extinguish your own fire, yourself. Thank you very much! 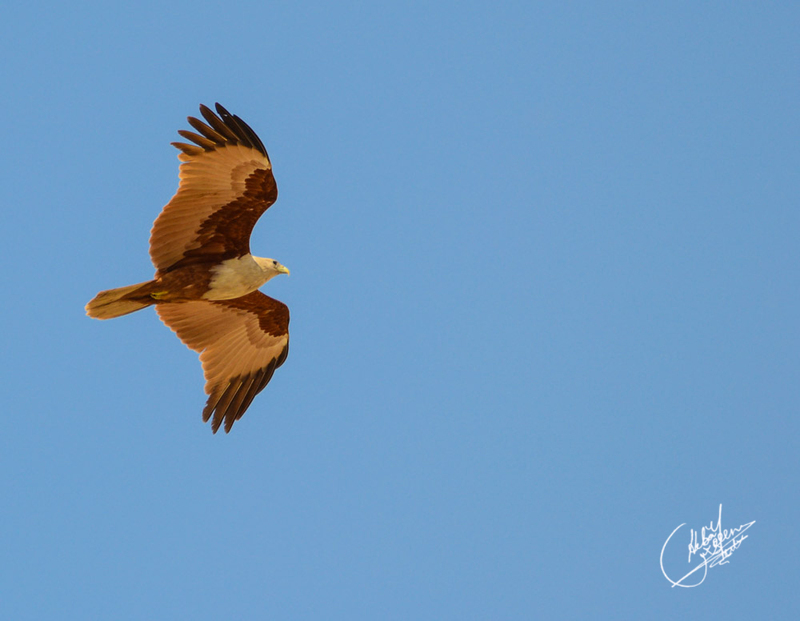 And this is where I got another lifer, the mighty Brahminy Kite! I likened it with Tiramisu ... oh just look at this coffee coloured bird, layers of coffee and cream, gliding away in the sky! 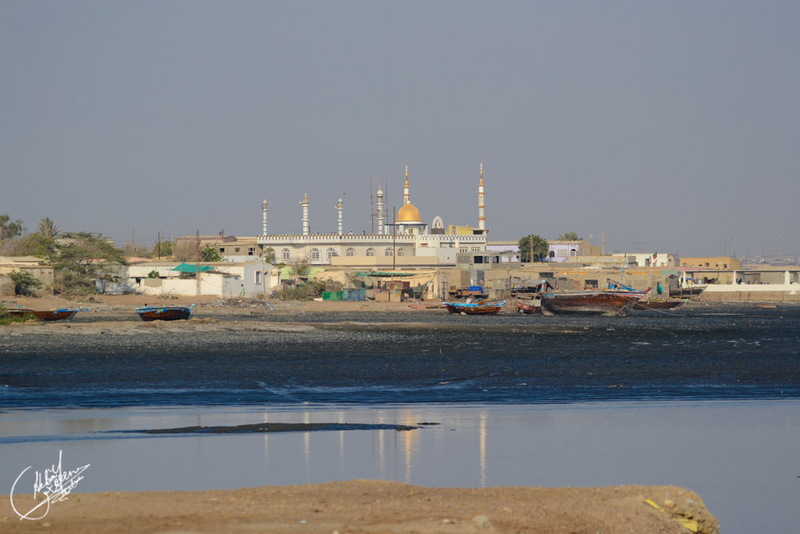 At the opposite end of Sandspit was this beautiful mosque and the most disgusting vast patch of untreated effluent dump. It's ironic that 500 MDGs (Million Gallons per Day) of untreated effluent from Karachi is dumped into our seas each day and no one is answerable for this crime! Who cares? Will anyone ever will? 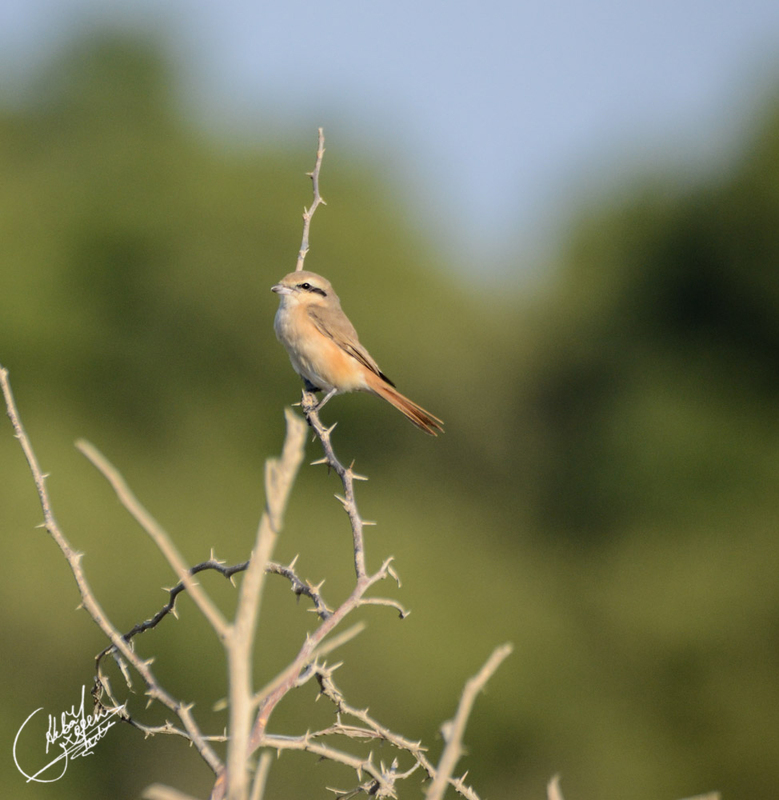 Below are some more pictures from our trip ... and folks, this is all until the next birding gathering.